This was one of my favorite dishes growing up, and is a good way to eat a lot of fresh veggies. The name is just what my mom used to call it, it most closely resembles chow mein. 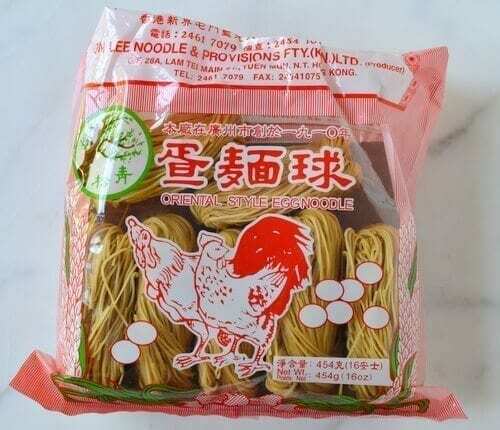 6-8 servings Chinese egg noodles, get the kind that looks like this (I have had good luck finding them in Asian markets). Start a large pot of water to boil and preheat the oven to 350F. Add egg noodles to boiling water and cook them according to the instructions. Once done cooking strain and toss with 1/8-1/4 cup oil, until the noodles are well covered. Spread noodles out on a baking sheet in an even layer. Put noodles in the oven, check every 10 minutes until the start to become crispy. Once they begin to become crispy toss/stir them and then spread in a thin layer again and put back in the oven. When they get close to your desired done-ness, start checking them every 5 minutes. While the noodles cook move on to the rest of the cooking, this way everything is done roughly at the same time. Once the noodles are done, remove them from the oven and set them aside. On high heat add ~1 Tablespoon oil to a wok. Once very hot add chicken, stirring often cook until brown bit start to form on the chicken. Once done remove chicken to a bowl and set aside. Return wok to high heat. Add another tablespoon of oil to the wok, once very hot add all the veggies except for the bok choy and bean sprouts. Stirring frequently cook until veggies are almost done and still crispy. While veggies cook, make the sauce by combining the chicken broth, soy sauce and 2 Tablespoons corn starch, mixing until corn starch is dissolved. Once veggies are almost done add the bok choy and cooked chicken and cook for another 1-2 minutes. Once bok choy leaves are wilted add the sauce, and stir to coat. Then add the bean sprouts and cook for another 1-2 minutes or until sauce is thickened. Remove from heat. To serve, in a large dish arrange the noodles around the platter, breaking them up into smaller chunks to make for easier serving, leaving a whole in the center. Then add the chicken and vegetable mixture to the middle. By not covering all the noodles on the serving platter they will stay crispy longer. Serve immediately. Like much Asian cooking the trick here is to prep EVERYTHING before you start cooking so that once you are done you can serve the dish steaming hot. This includes setting the table, making sure everyone has drinks for their meal, laying out the array of condiments and prepping all the vegetables and garnishes before you start to cook. 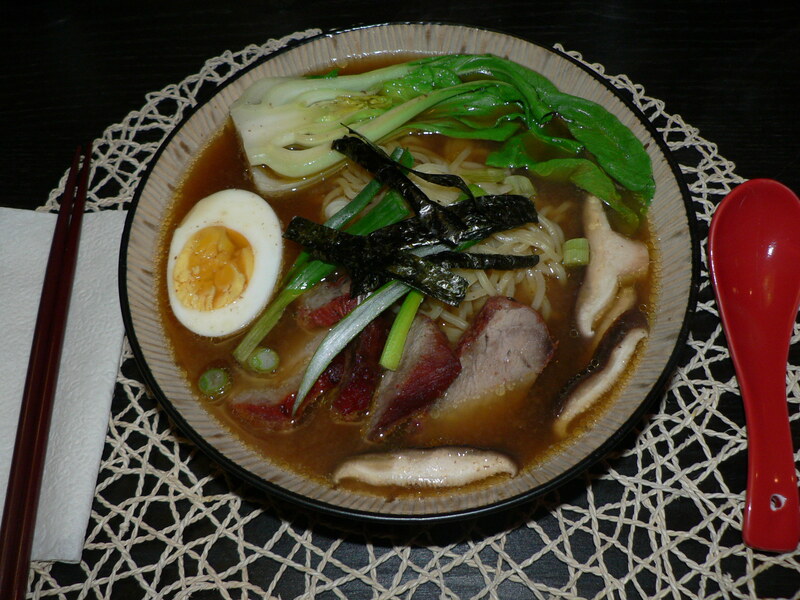 Ramen noodles are delicate, if they sit too long in a hot broth they get mushy, and mushy noodles just aren’t as good! Fill a large pot with water and bring to a boil (this will be to cook the noodles). Also bring pot that you will use to steam the veggies to a boil. ( I use the same pot of water to both steam my veggies and cook the noodles.) Bring broth to a boil in a separate pot, add half of sauce packet that came with the noodles ot the broth. Prep mushrooms and bok choy and arrange in a steamer basket. In a pot with a clear lid, place egg and fill with half an inch of water. Bring to a boil over a high heat, once boiling reduce to medium and cook for 4 minutes. Do not remove lid. After 4 minutes, remove from heat and let sit for 3 minutes, do not remove lid. After 3 minutes remove eggs and place in cold water. Peal eggs once cool enough to touch. Steam vegetables for 3-4 minutes, until they are until mostly cooked. Do not over cook, leaves of baby bok choy should not be too wilted. Cook noodles as instructed by the package except 30 seconds less (as noodles will continue to cook in the hot soup broth). In serving bowls, divide noodles into the two bowls. Arrange hot BBQ pork, bok choy, and mushrooms around the edges of the bowl. Slice egg in half and add half to each bowl. Ladle half the broth into each bowl. Garnish with scallions and slices nori.